Photo courtesy of Dan Beckman, Professional Team BJason McClain at the "The Boys Are Back In Town" PTBR event, March 20, 2010. Things are going well for Western Slope bull rider Jason McClain of Lewis, Colo. “Rodeo’s a different deal when you’re healthy,” explains McClain. “Right now I’ve got a good thing going. I’m home during the week, then go rodeo on the weekends.” McClain will occasionally enter an independent bull riding – like the March 20, 2010 Professional Team Bull Riding (PTBR) event held in Greeley, Colo., but competes most often these days on the Professional Bull Riders (PBR) circuit in the Touring Pro Division. Jason makes a good point here. Twenty places in the sport of bull riding is not a huge gap. 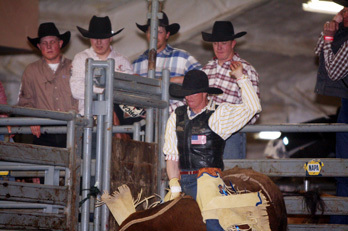 Many things can come into play during a bull riding season, especially injuries.